Selena Gomez's dummy was unveiled in Berlin on Thursday. The 22-year-old turns 32 in her latest reincarnation as a Madame Tussauds waxwork. Her life size figure looks decidedly aged, with a powdery, washed-out complexion. It took a team of 20 artists four months to create the dummy, showing the songstress dressed in a pair of leather hot pants and sheer blouse - an outfit she wore at a gig in London last September. The waxwork was previously showed off at Madame Tussauds' New York location in August before the big reveal today in Germany (either it is a replica of the replica, or the dummy was shipped overseas). 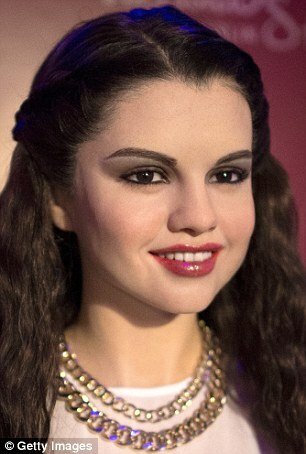 The waxwork of Selena at Madame Tussauds Hollywood - revealed last December - is perhaps the best likeness. There is also a Selena figure at the Washington DC location - unveiled in 2010 - and the following year the New York branch revealed dummies of Selena and Justin Bieber, her on-off boyfriend.